Home Porsche Driver’s Selection Porsche lifestyle products: an expression of your way of life. Porsche umbrella and other outdoor items. We know that quality is important to our customers, so it is no surprise that they would not buy just any umbrella. Porsche Driver's Selection has one of these everyday items on offer. With our umbrella, you will stay dry whatever the weather and demonstrate to other people your love of motorsports. You will also be impressed by the high quality and simple design of the other products in this category. The Porsche accessories have been carefully thought out down to the smallest detail and are of the usual first-class quality. 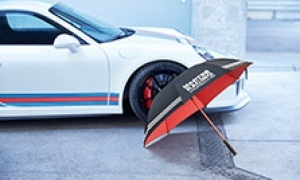 From rucksacks and torches to umbrellas, you can rely on Porsche Driver's Selection products.